Your kidneys are the chemical filters for your body. These bean-shaped organs constantly screen your blood, removing wastes and excess fluids. Healthy kidneys maintain the chemical balance your body needs. Kidney stones are made up of chemical crystals that separate out from urine. These crystals clump together to make “stones.” They form in the calix of the kidney. They may stay in the kidney or move into the urinary tract. Kidneys form stones for many reasons. If you don’t drink enough fluid, for instance, you won’t have enough urine to dilute chemicals. Then the chemicals may form crystals, which can develop into stones. Fluid loss (dehydration) can concentrate urine, causing stones to form. Certain foods contain large amounts of the chemicals that sometimes crystallize into stones. Kidney infections foster stones by slowing urine flow or changing the acid balance of your urine. Family history – if relatives have had kidney stones, you’re more likely to have them, too. 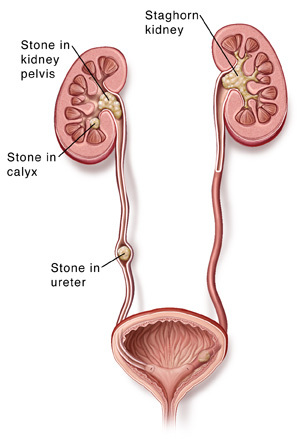 Stones begin in the cup-shaped part of the kidney (calix). Some stay and grow. Others move within the kidney or into the ureter. There they can lodge, block the flow of urine, and cause pain. Many stones cause sudden and severe pain and bloody urine. Others cause nausea or frequent, burning urination. Symptoms often depend on your stone’s size and location. Fever may indicate a serious infection. Call your doctor right away if you develop a fever.